As a parody of the cliche has it, 'nothing succeeds like excess'. Not so with this book - only the latter. So be warned; South Pacific mid-century nostalgia and district life hazards notwithstanding, you won't stay up nights for 345 pages of near narcissism amid the minutiae of colonial administration. But if you want to know what time the taxi came in the morning, this may be the book for you. There is a seemingly endless list of author's acknowledgements and thanks - about 150 of them. They range from actor Raymond Burr to a Swiss cavalry colonel. It is all calculated, one suspects, to persuade those still alive to buy the book on the basis of a 'mention'. Those who do, might come to question whether it is #24-50 well spent. Snow's personal and literary life has been lived in the cultivated shadow of his distinguished elder brother, author and scientist C. P. (Lord) Snow. They came from a modest Leicester family. C. P. Snow's eleven-novel sequence Strangers and Brothers was matched only by Anthony Powell's twelve-novel Dance to the Music of Time. Philip Snow's title The Years of Hope, clearly derives from his brother's Time of Hope, the first in the C. P. Snow series. But there any literary parallel ends, apart from the long-distance reflective presence of Elder Brother during Philip Snow's fourteen years in Fiji (1938-52). Thereafter, Rugby School claimed him as bursar until 1976. Snow and three other young administrative officer cadets sailed to Fiji from London in August 1938. On arrival at Suva, they were paraded on the dock by a peppery establishment officer and, as Snow tells it, given 'one word of advice: keep your mouths shut'. The story I heard years later from one of the other new arrivals was rather better. 'Kindly remember this. There are two things you must do to survive in Fiji,' declared the E.O: 'Keep your bowels open and your mouths shut'. In Snow's case, it was not effective, it would sadly seem, in respect at least of the second admonition. As with many of us. Snow's was a second-eleven colonial career, limited to one territory. His portrait of a relaxed and benign Fijian people half a century ago is undoubtedly of interest, not least in the contrast with the tough competitive commercialism they face in the contemporary Pacific and wider world. And there is a valuable picture of the first distinguished modern-day Fijian leader, Ratu Sir Lala Sukuna, whom Snow knew well. It was with Sukuna as President that Snow founded the Fiji Cricket Association and became its first Honorary Secretary in 1946. There are 22 black and white photographs. Snow and/or his wife Anne figure variously in twelve of them. Then there are Government House, a Governor or two, selected Fijian chiefs and a comely mixed-blood damsel. The rest of the interracially fertile people of Fiji do not get much of a photographic look-in. Indians and Chinese, not at all. As one would expect from a South Pacific bibliographer, there is a painstakingly comprehensive index. 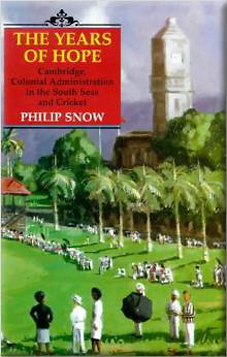 The jacket design consists of a pleasant post-war painting by Alfred Stone of a cricket match on Suva's Albert Park: palm trees. Government Buildings with the Legislative Council chamber, the courts and the Colonial Secretary's clock tower, the Grand Pacific Hotel and Suva Bay. Not just nostalgia here: it was where, much later, in May 1987, a Royal Fiji Military Forces coup was mounted and a newly-elected government hijacked. The incipient shadows of future strife in Fiji were already gathering in Snow's time. But you wouldn't know it from this book. Snow says that he founded and edited the Journal of the Civil Servants Association for Fiji and the Western Pacific. 'I never could resist the lure of print', he confesses with feckless candour. His entry in Who's Who runs to thirty-five lines; in contrast, that of Sir Robert Foster, GCMG, KCVQ, last Governor and first post-independence Governor-General of Fiji, to a modest eleven lines.